Includes Adapter, Pet Door with Flap. Aluminum Adpter and frame. Install easily into sliding screen doors. Always install in corner under handle side of door. 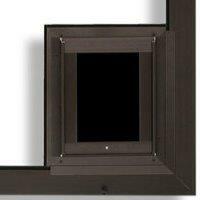 Pet Doors easily install with our 1/2" sliding screen doors #2 and #4. All other kits require minor modification as the pet door will cover the wheel assembly adjustment. If your looking to install on your current screen door ensure the adapter doesnt cover a top adjusting wheel assembly. Otherwise slight modification will be required to adjust. Typically a small hole will need to be drilled to access the adjustment screw.